Leslie Basham: When did conflict in marriage begin? Here's Dr. Wayne Grudem. Dr. Wayne Grudem: Before the fall, Adam and Eve had a relationship that was beautiful, harmonious, loving, and kind, and yet there was a leadership role that Adam had that Eve did not have. After the fall God says I am going to introduce conflict here as a punishment. The punishment is: Eve, you're going resist that authority that Adam has, and Adam, you are going to rule over her by virtue of the fact that you are stronger. And there's conflict. Leslie Basham: You are listening to Revive Our Hearts with Nancy Leigh DeMoss for Wednesday, May 18th. We're in the middle of a series called, Men and Women: Similarities and Differences. Here's Nancy to introduce our topic today. Nancy Leigh DeMoss: Well, after this week's broadcast of Revive Our Hearts, no one will ever be able to accuse us of dodging hot topics or staying away from controversial issues. I am sure we will get some letters, and I hope we do. We want to hear how you respond to what you hear this week. The messages being presented this week runs counter to our culture, not only to the teaching that is out there in the world, but to much of the teaching, sadly, that has been taking place in the evangelical world over the last 20 or 30 years. That's why I think it's so important that this message be heard, that we go back to what does the Scripture teach about the appropriate and biblical roles of men and women both in the home and in the church. That is why we are airing this week a message by Dr. Wayne Grudem, who is a professor at Phoenix Seminary in Scottsdale, Arizona. He has written numerous texts on systematic theology and biblical manhood and womanhood. His newest book is a wealth of information that responds to more than 100 disputed issues that have been raised by those that have been called evangelical feminists today. He addresses those issues from a very thorough and biblical perspective. Over the last couple of days, he has been explaining that men and women are equal before God in value and in dignity, but that they have different roles in marriage, and that is part of God's created order. Now, today he tackles the whole subject of male headship in the home. What does that mean? What does that look like? What are the implications? Why is this a concept to be embraced and enjoyed and to thank the Lord for rather than something, as women, to resent or resist? Let's join Dr. Grudem as he talks about the implications of male headship in the home. Dr. Wayne Grudem: Someone might say, "Well, okay, fine. There's a leadership role for Adam, and I guess that means husbands should have a leadership role in their marriage of some sort. But how does it work? How does it work in practice?" In our own marriage, Margaret and I talk frequently and at length about many decisions. I can tell you that I wouldn't be here tonight unless Margaret and I had talked about this and asked the Lord about it, and she had given blessing to it, and said, "Yes, I think that's right." Sometimes we make large decisions such as buying a house or a car, and sometimes they are small decisions like where we should go for a walk together. I often defer to Margaret's wishes, and she often defers to mine because we love each other. In almost every case, each of us has some wisdom and insight that the other does not have. Usually, we reach agreement on the decisions that we make. Very seldom will I do something that she doesn't think is wise--I didn't say never. She prays; she trusts God; she loves God. She is sensitive to God's leading and direction, but in every decision, whether it large or small and whether we have reached agreement or not, the responsibility to make the decision still rests with me. Now, I am not talking about every decision they make individually. Margaret controls a much larger portion of our budget than I do because all the things having to do with the household and food and clothing and house expenses and everything . . . she writes the checks and pays the bills. I take care of buying books and some things about the car. I have appointments during the day with students. She doesn't get involved in that. She has her own appointments. She has her own calendar. I don't get involved in trying to micromanage all of that. We have distinct areas of responsibility. I am not talking about those things. I don't get involved in those things unless she asks my counsel. Just about three years ago, maybe four years ago now, we started the decision making process. Margaret had been in an auto accident in Chicago. As part of the aftermath of that accident, she was experiencing some chronic pain that was aggravated by cold and humidity, and Chicago is cold in the winter and humid in the summer. Chicago was not a good place for that. Some friends said to us, "We have a second house in Mesa, Arizona, if you would ever like to go there and just use it as a vacation place, we would like you to do that." So we did. We visited Arizona. Mesa is a suburb of Phoenix. Margaret felt better. It was hot, and it was dry. And so I said, "Wow, Margaret I would love to move here, but I am only trained to do one thing; I can teach at a seminary and that is it. There aren't any seminaries here." The next day Margaret was looking in the yellow pages--literally. She said, "Wayne, there's something here called Phoenix Seminary." One thing led to another and God was at work in that seminary, and it was starting to grow. Then we went through a decision making process. When we were in the middle of that decision making process, on the very day that we were focusing on that, I came in my normal custom of reading through a section of scripture each day, I came to a Ephesians 5:28, "Even so husbands should love their wives as their own bodies." I thought if I would move to take a job in another city for the sake of my body, if I were experiencing the pain that Margaret had, and husbands should love their wives as their own bodies--then shouldn't I move? Shouldn't I be willing to move for Margaret's sake? That was really why we moved to Phoenix. I just say that by way of illustration, husbands, headship doesn't mean selfishness. It means being willing to give of yourself for your wife and care for her as well. God has brought . . . I think that was obedience to Him and God has brought blessing. But there are dangers, there are dangers of distortion in male headship and female submission to or support of that headship. There are dangers of distortion in one direction or another. There are errors of passivity and errors of aggressiveness. I put this on a chart of husband and wife. In the middle is the biblical ideal for a husband as loving, humble headship. That's the ideal. For a wife the ideal is joyful, intelligent submission to that headship. Intelligent, that means she is contributing her wisdom and her counsel to the decision making process. On the right side of the chart there are errors of aggressiveness. A husband can be a tyrant. "Everybody serve me." He's selfish; he's harsh, and he's abusive. That's an error of aggressiveness. Or a wife can be a usurper, resisting and rebelling against and being hostile toward her husband's leadership time and again and challenging for it. When a tyrant is married to a usurper there is conflict all the time. But there are opposite errors. There are errors of passivity. A husband can be entirely passive. He comes home from work; he clicks on the TV; he plops down in his chair, and he wants everyone to wait on him. The children are disobedient; he does nothing. He's entirely passive. There is a hostile neighbor that needs to be dealt with and addressed, but his wife is dealing with the conflict all by herself. He is a wimp. That's an error of passivity. There is an error of passivity on the wife's part. Day after day, month after month, year after year in their marriage, "Yes dear, whatever you say . . . yes dear, whatever you say." She doesn't contribute at all to the decision making process. She has no preferences, no desires. She's a doormat. That is an error as well. That's not the biblical pattern. If a tyrant gets married to a doormat you get all sorts of abuse, and it's dehumanizing for both of them, but particularly for the wife. If you get a wimp married to a usurper, well, he follows her around all day long, six steps behind just doing what she takes the leadership in. If you get a wimp married to a doormat, everything runs like the energizer bunny running out of batteries, finally. It just all goes downhill and everything goes wrong in the family. There's nobody taking responsibility. The biblical ideal is loving, humble headship and joyful, intelligent submission. Now, you have personalities and backgrounds that predispose you to make mistakes on one side or the other of this chart. For those of you, you could think perhaps about marriages you know or relationships you know. You can see people making errors in both sides of this, but those are distortions. Those are distortions of the biblical pattern. 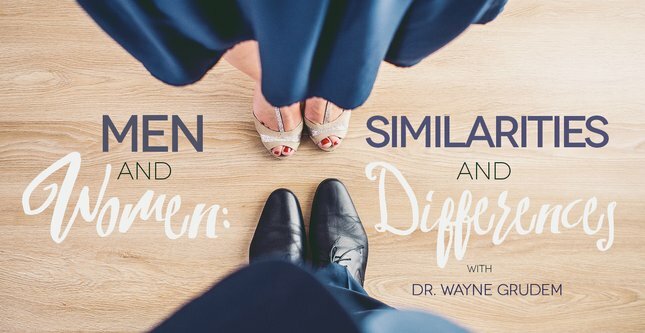 Nancy Leigh DeMoss: Well, that's Dr. Wayne Grudem calling us to embrace the biblical ideal, as he called it, of loving, humble headship of men in the home and then the joyful, intelligent submission of wives to that headship. As we have been doing all this week, I want to encourage you to order a copy of a booklet that Dr. Grudem has co-authored with John Piper called Fifty Crucial Questions. It is an overview of various concerns and issues that people raise today about manhood and womanhood. What does the Scripture teach about these issues of submission and authority, and how they are to be practically applied in the church and the home? This is something that you need to understand, and as moms you need to be teaching your sons and daughters to understand these principles as well. When you order this booklet, we will send along a free copy of Dr. Grudem's notes from this message, and they will include that chart that Dr. Grudem referred to on today's broadcast. Leslie Basham: Here's how to order. Just call 1-800-569-5959. Ask for the booklet, Fifty Crucial Questions. When you order ask for the free study guide. Again, the number is 1-800-569-5959. You can also download the study guide for free by visiting ReviveOurHearts.com. While you are there you can order a CD of today's message and other material from Dr. Grudem. Do you know that when you and your husband are experiencing oneness it brings God glory? In fact, it reflects something about the nature of the Trinity. Find out why tomorrow on Revive Our Hearts.